Learning the letters of the alphabet can be a challenge for some kids. Of course, with nearly 30 of them to remember and a few of them looking so incredibly similar, it’s no wonder that this concept can be a tricky one to master. One of the easiest ways to help them retain the letters as they learn them is to make it fun, but how exactly do you do that? Well thankfully, with a quick search of either Pinterest or Google, you can find a ton of ways to make practicing those early literacy skills a little more enjoyable for both you and your kiddos, but today, we’re sharing our current favorite. Alphabet Bingo! Now, learning the letters of the alphabet takes time. 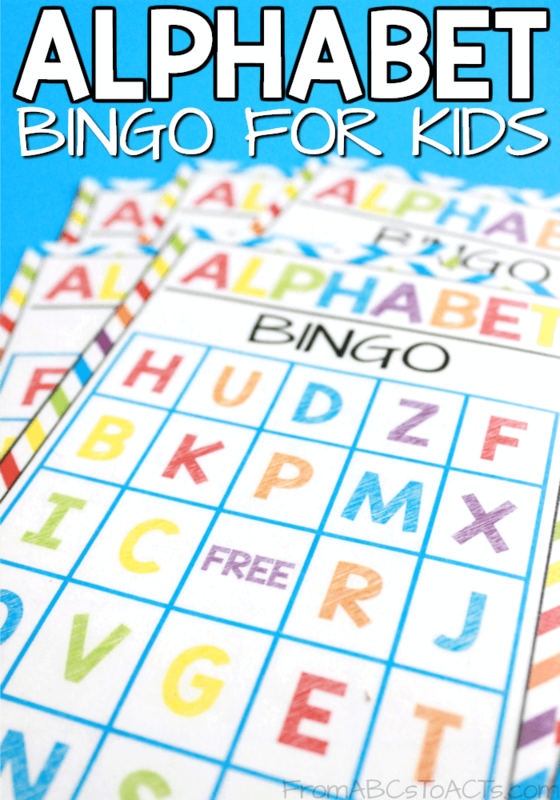 In fact, we spend almost a full year crafting our way through the alphabet when we make our preschool alphabet book, but once your child has a good understanding of the alphabet and recognizes most of their letters, this printable alphabet bingo game is perfect for practicing. This printable set includes six different bingo cards so you can play with small groups or play multiple times with just two or three. You’ll also find a full alphabet sheet included in the download so that you can mark off each letter as you call it. Playing works the same as any other bingo game that you’ve played before. Just call out a letter, have your child place a marker on the letter if they have it on their card, and call it when they have a bingo. To make it a little more interesting for older children, give a few different patterns a try. For instance, make covering the four corners the way to call a bingo, or blacking out the card. Obviously, you can use anything you like for markers including bingo daubers, pattern blocks, M&Ms, even pom poms. Personally, when we break out this colorful version of alphabet bingo, we like to use our set of Bunchems. They’re small and squishy so they add a fun fine motor element to our game and the colors match those that we used to make our bingo cards so we often end up matching the colored Bunchems to the colored letters on the card which just adds a whole other level of learning to what is a simple, easy to set up game of alphabet bingo. To start the game, each child gets their own bingo card and a handful of markers. Call out a letter of the alphabet and mark it off on your alphabet sheet so that you know that it’s been called. I like to just stick our alphabet sheet into a dry erase pocket and mark them off with a dry erase marker as we go along. That way, I can easily erase and start all over again when we’re ready to play another round. The game ends when someone winds up with a bingo and if your kids are anything like mine, they will quickly be ready to get another game going.